If your cellular provider’s mobile hotspot/tethering plans are too pricey, skip them and tether your phone to your computer without inflating your monthly bill. Read on to see how you can score free mobile internet. I recently found out that my cellphone company charges $30 a month to use your smartphone as a data modem. That’s an outrageous price when I already pay an extra $15 a month charge just because they insist that because I have a smartphone I need a data plan because I’ll be using so much more data than other users. They expect me to pay what amounts to a $45 a month premium just to do some occasional surfing and email checking from the comfort of my laptop instead of the much smaller smartphone screen! Surely there is a work around? I’m running Windows 7 on my laptop and I have an Android phone running Android OS 2.2. Help! Well Double Dipping, this is a sentiment we can strongly related to as many of us on staff are in a similar situation. It’s absurd that so many companies charge you to use the data connection on the phone you’re already paying for. There is no difference in bandwidth usage if you stream Pandora to your phone or to your laptop, for example. Fortunately we have a solution for you. It’s not free-as-in-beer but it only costs $16 which, over the first year of use alone, will save you $344. Let’s get started! PdaNet costs $15.95 and comes with a free trial. You can keep using it indefinitely but after the trial ends you will no longer be able to visit secure web sites. If you’re just using the tether for goofing off on your break at work then you may never need to upgrade. For checking your email, banking web sites, shopping, and other secure applications however it is more than worth it to upgrade your license. 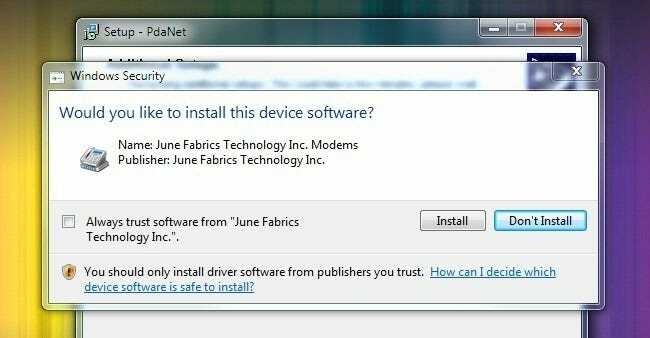 Note: Although we’re using an Android device and a Windows machine for this tutorial PdaNet is available for a diverse array of devices. You can get the mobile component of PdaNet for Android phones, iPhones, BlackBerries, Windows Mobile phones, and even the Palm OS. The desktop component is available for both Windows and Mac OS X. The following setup steps should easily translate across the various combinations of mobile and desktop components. First, search the Android Market for PdaNet (if you’re curious why there are duplicate copies of the search results in our Market search, that’s a mystery best left to the Google engineers). On the off chance that there are future applications with a similar name, make sure to install the one from June Fabrics Technology Inc.
Go ahead and run the application once it has finished installing. Tap “Enable USB Tether” to turn it on. You can also do a wireless tether using Bluetooth but we’re skipping that for now. Bluetooth can be so finicky we don’t want you to get mired down in trying to figure out why your Bluetooth connection is acting up. When you enable it for the first time it will prompt you, as seen in the last panel, to download the desktop software. This is handy for those times you’re stuck without any internet but the internet on your phone and need to download and transfer the application to your computer. In our case we clicked No, since the computer we’re configuring already has internet access and we can download the desktop app that way. Installing the desktop software is pretty uneventful and requires no configuration. There are, however, a few things to watch out for. If you have the Android Deveopment toolkit on your computer (as you may have if you followed along with our guide to remote controlling and viewing your Android phone) you’ll run into two potential errors. If the abd.exe is running you’ll have to kill the process with Task Manager. You’ll also get a notification that there are Android drivers already installed on the computer. When in doubt overwrite the drivers with the new ones from PdaNet to ensure you can connect to the internet properly. After the installation you’ll see the PdaNet icon in the corner. It should automatically connect when you plug your phone (with the USB tethering enabled) into your computer. If it doesn’t, right click on the icon and select Connect Internet. Success! Have an Android hack to share? Let’s hear about it in the comments. Want to know how to do something on your Android phone? We want to hear about that too.